Six books into a projected nine book series and you would expect Ty Franck and Daniel Abraham aka James SA Corey to slow down just a little. And coming off a massive solar system shaking event in last year’s Nemesis Games (reviewed here), this is what they do. Babylon’s Ashes, for all of its action set pieces feels like a consolidation and table setting for the projected final three volumes of this epic space opera series. That does not mean they have throttled back on the action but there is only a little of the weird alien goings on or massive events that have characterised earlier volumes. Rather the focus is on the shifting allegiances, politics, battles and fixes required to manage both a war and a crisis on an unprecedented scale. The book opens on an Earth completely devastated by the Belter Free Navy in Nemesis Games. Millions have died and millions continue to die as pawns in a political struggle between the combined forces of Earth and Mars and the Free Navy, armed by Martian military dissidents. In the middle of it all, as always, are James Holden and the crew of the Rocinante. While Holden, Naomi, Alex and Amos took centre stage in Nemesis Games they each only get a couple of point of view chapters in a narrative that ranges across many characters, some new but many familiar to those who have stuck with this series. The scope of the plot of Babylon’s Ashes, ranging across the solar system, necessitates a more diffuse view of the action than previous volumes. This gives the book a slightly different feel to previous volumes which all focussed their points of view tightly on a small number of characters. The narrative spread of Babylon’s Ashes is both a necessity and a weakness. It does mean getting to drop briefly in on previous POV characters such as Martian marine Bobbie Draper, Ganymede scientist Prax and now leader of Earth Chrisjen Avasarala, and new POVs including a great chapter involving the political machinations of Anderson Dawes. But as a result, Babylon’s Ashes feels a less character-driven and a little less focussed than earlier volumes, the characters being deployed mainly to move the increasingly multi-stranded plot along. 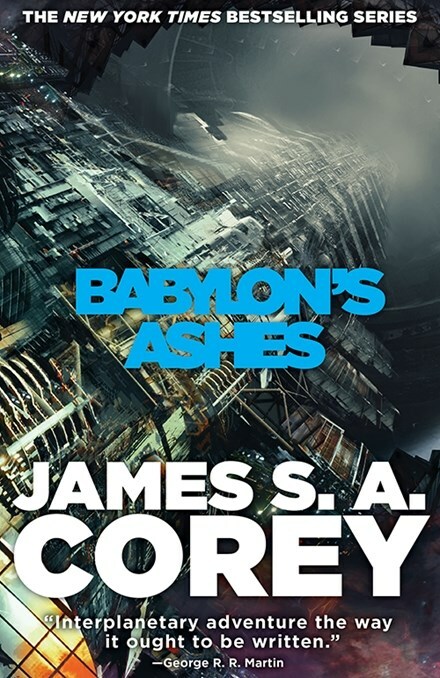 Despite any minor shortcomings, Babylon’s Ashes is another strong entry in what is an already epic space opera series. It has everything readers have come to expect – plot driven, page-turning action anchored by a core group of likeable heroes. Corey has a firm grip on the manoeuvring and politics, both personal and societal, of all of the major players. As in Nemesis Games, the personal often becomes the political and vice versa. The space battles, as always, are white knuckled and grippingly realised. And while in other hands the end could have felt a little deus ex machina, it is firmly built on a mystery that has been getting plenty of background play now over the last two books and is likely to feature more heavily in the next volume. There is nothing about this book that is stand alone but book six is not the place to jump in to any series. Readers who love good science fiction who have not yet caught up with The Expanse are strongly advised to start with Leviathan Wakes (or for a taster, check out the first season of The Expanse TV series (Netflix) which ends about two thirds of the way through that book). But fans will not be disappointed. And while there is no dire cliffhanger ending, there are still plenty of balls in the air and plenty of expectation for book seven, due sometime in 2017.